Letter of introduction from Denise Saunders, Proprietor of RegencyRags. Pictures of the cats and cattery including interesting facts about how the kittens are raised. I’ve been thinking a lot lately about the orgins of RegencyRags. I still remember New Year’s Eve 1999, lying in bed at home after a party with visions of my cattery’s future dancing in my mind’s eye. That early morning I didn’t know whether I’d be a success or not. I didn’t know if I’d ever win a cat show final ever, but I knew I was giving this venture everything I had. 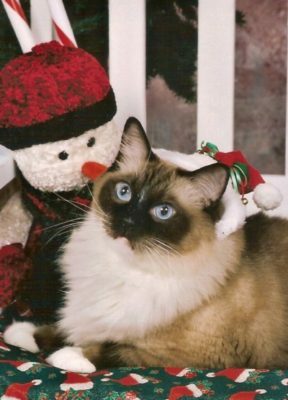 More than anything I wanted to be a Ragdoll exhibitor and breeder extraordinaire. As with most cat breeders, I, too, loved cats from a very early age. Except with me various circumstances prohibited me from having any sorts of pets except for fish, hamsters, parakeets and the like. I enjoy telling the story of when I was like 7 years old and I’d been begging again for a kitten. My mother gave me a hug, telling me when I grew up and got married I could have as many cats as I wanted. Well, I ran with that one! Except not literally because the highest number I’ve ever kept at the same time was ten Ragdoll cats — six females and four males. To date I have a total of eight Ragdoll cats — five females and three males. I’ve never kept more Ragdolls than I could adequately maintain. And when my numbers get too high for my own comfort level, I sit back and think about who needs to be retired and found a new home. It’s always a hard decision when placing one of my retired breeders, but I do it knowing they will get their own personal family who’ll love and dote on them in high-pampered style. Yet, I digress. When I had a place of my own I answered an classified ad for free kittens in Long Beach, CA where I was living after graduating from college. 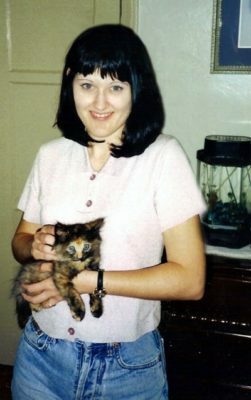 I’d always wanted a calico, and the sweet-faced torbie I’m holding in the picture to the left caught my eye immediately. Like most free kittens she was only 5 wks old when I brought her home — far too young to have been whisked away from her mother and littermates. But back then I didn’t know any better, so I brought her home after a quick stop at Petsmart. I named her Celeste because her eyes twinkled mischievously and it was a name I’d liked of one of the minor characters back when I was still watching 90210. Celeste ate solid food like a pro and never once pottied outside her litterbox. However, because she’d never been properly socialized, I had one independently minded kitten on my hands. By the time she reached 12 wks old she wouldn’t let me come near her. By 16 wks old she was biting me, clawing my legs and destroying the house. What I didn’t know back then was kittens learn so much more from their mothers than I realized. 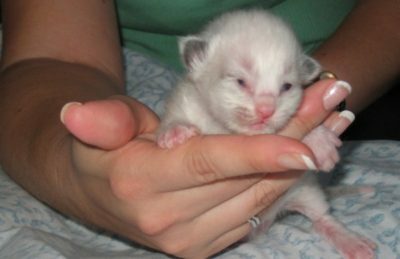 A mother cat who’s coddled and loved by her family will signal to her baby kittens that humans are good. I’ve experienced this first hand in my own cattery when I brought in females from other breeders that hadn’t been properly socialized. I kept Celeste inside the house and may do by replacing things she’d destroy while I was away at work. About the time of her 1st birthday she tore up the edge of the carpeting along my living room floor. It took me a while, but I soon realized she’d been trying to get out. Because I lived in the city on the corner of a busy intersection I knew that I couldn’t let her be an inside/outside cat. Not knowing what else to do I called my parents. They agreed to let her roam their semi-country property. She took to the fresh air and open space immediately. My dad tells me for years he never had a gopher problem and no one in the family got a mouse scare when bringing in logs from the woodpile. In Feb. 2010 she’ll turn 14 yrs old. She’s remained standoffish, but I’ve enjoyed our visits with her when I see my parents who continue to reside in Santa Barbara County. With Celeste settled nicely in a new home I decided to see what I could find out what had gone wrong. Back then the internet was still in its infancy. I did my research in Carlton Books. Okay, once I actually did buy a book, one that proved to be a valuable asset. It’s entitled The Indoor Cat by Patricia Curtis (Dec 1, 1997) and now out of print, but it opened my eyes to several things I did wrong. First, I had brought home a kitten far too young to be separated from her mother; then I worked full time and hung out with my friends after work and on the weekends. I thought Celeste was being destructive when she was actually entertaining herself. Celeste began to experience what’s known as “single cat syndrome” that’s easily fixed by bringing home another kitten. Please contact me if you’d like additional information regarding “single cat syndrome” or give it a google — several good sites will pop up for you. As mentioned earlier, I did own several pet birds as a child. We purchased our first cockatiel from a pet store without knowing anything about birds. The friendliest this bird got was when he bit your finger. Afterwards we found out there’s a difference between hand-fed chicks and wild reared ones. It made me wonder if there was a correlation between early socialization and good behavior in cats as well. 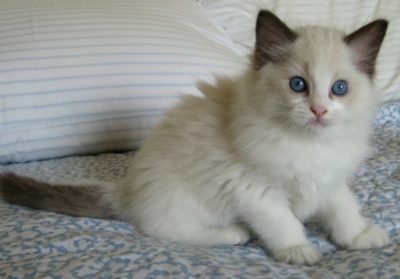 My first Ragdoll kitten was a very mismarked seal bicolor female I named Ponette after a French flick I’d seen the year before. Back then not everyone had a digital camera so I received exactly two pictures of this kitten before I drove three hours to pick her up. In one picture she was 2 wks old and the other shot was a profile of her head at 5 wks old along with her two littermates. Because of this I had no idea she was so mismarked, but having driven all that way to San Diego I took her home just the same all ready to begin my first Ragdoll kitten adventure. Except she didn’t exactly flop in my arms, and when she spent the first few days under the sofa I decided she was shy as well. 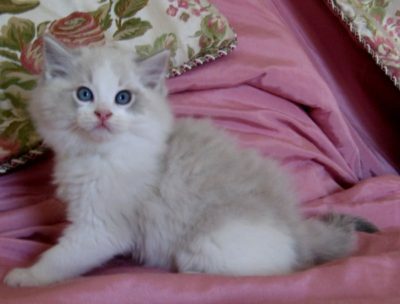 Not to be daunted, I only had 8 more weeks to wait for my second Ragdoll kitten. I decided to put my hopes in him. Over the years I’ve done some fine tuning to this process of socialization. Years of working with the kittens, watching them grow up and go off to their forever homes has reinforced my initial belief that “hand-raised” kittens are similar to “hand-raised” birds in that they form a strong bond with humans — they look to humans for love and support. That’s what makes a cat companionable. It’s those days working in front of the computer with your Ragdoll kitty sitting on your lap or chasing after the mouse marker on your monitor. It’s the nights watching TV with your Ragdoll lounged across the back of your couch with his head nuzzling your neck and purring. It’s the constant companion kitty that wants to take a shower with you and howls in disapproval when you shut the door — because Ragdoll kitties always want to be on the side of the door that includes you. 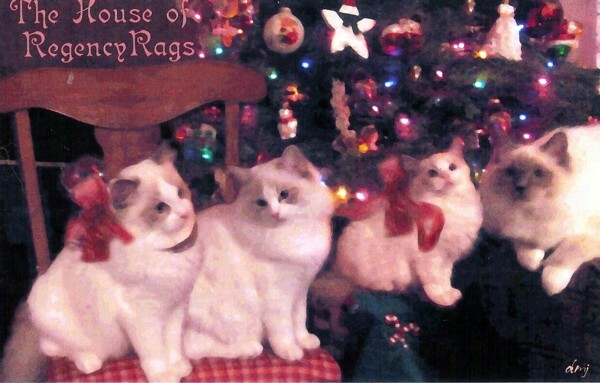 Those are Ragdoll cats. Those are the Ragdoll cats I produce in my cattery. I stand by my promise to raise the most socialized kittens that I can. Feel free to read the comments I’ve received from my kittens buyers over the years on my Previous Kittens Page. There you’ll find that my kittens buyers agree with me that my Ragdoll kittens are par none in sweetness, social abilities and health. 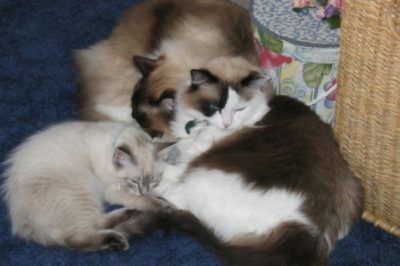 My Ragdoll cats and kittens run to the door to meet visitors, not hide under the bed! Pictured to the left is a darling seal bicolor Ragdoll kitten out of Chi Chi and Aristede at age 8 wks old originally named Danielle but who now answers to Dani. She lives with her doting family in Kemah, TX. You can see an updated picture of her on the Previous Kittens page and read the kind words her owners wrote about their sweet baby girl. I’ve recently finished the 2010/2011 TICA show season with a bang this year. From the beginning I always wanted to be a top notch cattery producing the very best Ragdolls possible. This year I’ve seen that dream come true with my gorgeous Blue Lynx Pt. Bicolor Male IW SGCRegencyRags Bravo Delighted Artiste aka Bruno — the 17th Best Longhair Cat Internationally in TICA(IW award is preliminary until finalized by TICA on July 1, 2011). To put that into perspective, Bruno was the 42nd Best All Breed Cat shown in TICA for the show season 2010/2011 out of a total of 3,186 All Breed cats shown in the Championship Class. Bruno is a large and muscular male with personality plus. He’s my pride and joy. He’s the culmination of all my hard work since that cold New Year’s Eve back in 1999 when I wondered if I’d even succeed as a Ragdoll breeder. Bruno is the darling son of my home grown RegencyRags girl, Daphne and home grown RegencyRags boy, Aristede. And, contrary to some razing I received from a rival Ragdoll breeder, he is most definitely out of my own lines: Daphne and Aristede. I have the DNA procured by my vet and tested by UC Davis to prove it. In the photo to the right is Bruno at 9 wks old. It’s easy to see he was the picture of his father, Aristede, as a baby kitten; yet, as he grew into an adult he more and more resembled his mother, Daphne. I’m simply thrilled to have achieved this success. The most important thing, though, is that I couldn’t have done this without God the Father, the Son and the Holy Spirit. To Him goes all the glory. He heard my fervant prayers along the way — all the way from the beginning of RegencyRags. He’s never left my side. RegencyRags wouldn’t be the success it is today without Him. In the Bible, Jesus tells us that the meek will inherit the earth, so I cannot claim any of this victory for myself. Without God I wouldn’t have this huge success, nor would I even be close to the person that I am today. Words can’t express my gratitude. I want everyone to understand that I couldn’t have done this without His divine hand covering me every step of the way. 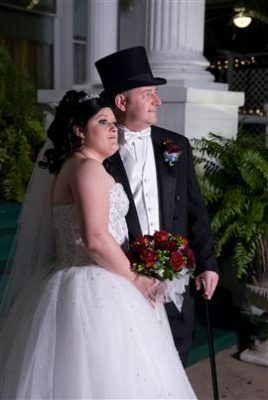 With God’s hand as my first covering, my second covering came from my husband, Craig. I couldn’t have done this without his support either. He’s had my back on this project every step of the way. It would have been impossible for me to do all the traveling I did without him staying behind at the home front cleaning out those litterboxes and making sure the floors got bleached. I knew he’d make the perfect husband for me when he delivered a litter of kittens while I was away receiving a Regional Award for Daphne. All this even before we were engaged! My darling husband is an attorney for a great firm in the Clear Lake area of Houston who specializes in all areas of real estate with his passion being the litigation aspects. Craig and I are members of our local Methodist church, Gateway Community Church in the Clear Lake area of Houston. He’s an integral member of BAHEP (Bay Area Houston Economic Partnership), holds a leadership role in our Life Group, and is a former student of Texas A&M at College Station. We don’t own a Collie for nothing! His great employment has allowed me to stay home and take full-time care of my cats and kittens. I am a native Californian who spent her first 35 years living either on the Central Coast enjoying the mild Mediterranian climate or the equally refreshing coastal breezes of Long Beach. I used to think 80 degrees was hot. It’s hard to believe that I’d never lived in a house with air conditioning until I moved to Texas. When it got warm we just left the windows open all night. When I first came to the Gulf Coast I couldn’t understand why people didn’t open their windows to let in a cool breeze. By that first May of 2006 I had a pretty good idea of the way it would be through September. Now I don’t open my windows either, except for three or four times a year. The years have gone by quickly. It’s been four and a half years later I can’t say that I’ve actually adjusted to the climate. I’ve endured a hurricane (Ike in 2008), I’ve survived living in sub-tropical climate, and I’ve come to truly appreciate what it means to sit in an ice cold movie theatre in August. But I’ve certainly adjusted to the good old fashioned Southern Hospitality I’ve found around here in Southeast Texas. The picture to the right is one of me taken when the cattery and I were still in California. 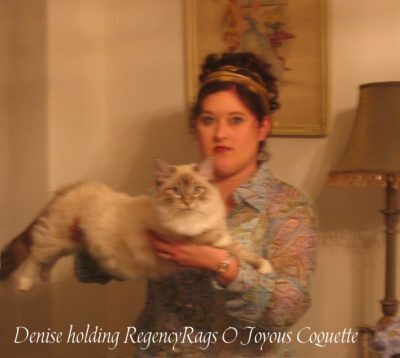 In this photo I’m holding RegencyRags O Joyous Coquette, aka CoCo Bear, and wearing my hair in the Regency fashion. My love for history has always been strong. My original intent was to name all my Ragdoll cats after American Regency Romances I had read (or devoured?) when I was in high school. For whatever reasons that never happened. But really, that is the whole reason I named my cattery RegencyRags and everything. So, this last January I brought home a new Ragdoll kitten from California and named her Snugglerags Delicate Dilemma, aka Danielle. Finally, I’ve named one of my cats after a Regency Romance!